A Nebula (nebulae) used to refer to any extended astronomical object. The term even referred to galaxies like the Andromeda Galaxy which used to be called the Andromeda Nebula. The term now refers to an interstellar cloud of dust, hydrogen, helium and other ionized gases. These regions are usually were stars are formed or made as the materials present in the nebula start to amass together getting larger and larger until they become massive enough to form a star. Some of the materials present in the nebula can also form planets and other astronomical object. Galaxies and star clusters are now considered different from a nebula which can be generally termed as a gas cloud in space. Diffuse Nebula - This is the most common type of nebulae. A diffuse nebula is a low density cloud where a star has recently formed. Planetary Nebula - When stars eject ionized gas in its later stages, this gas forms an expanding glowing shell which is called a planetary nebula. Protoplanetary Nebula or Preplanetary Nebula (PPN) - It is a nebula that is subsequently going to form into a Planetary Nebula. It can be considered as a pre-stage to a planetary nebula. Supernova Remnant - This is formed when a high mass star, in its final stages, explodes. The stellar explosion of a suprnova is more powerful than a regular nova. The expanding gas and materials released from the it forms a supernova remnant, which is a special diffuse nebula. 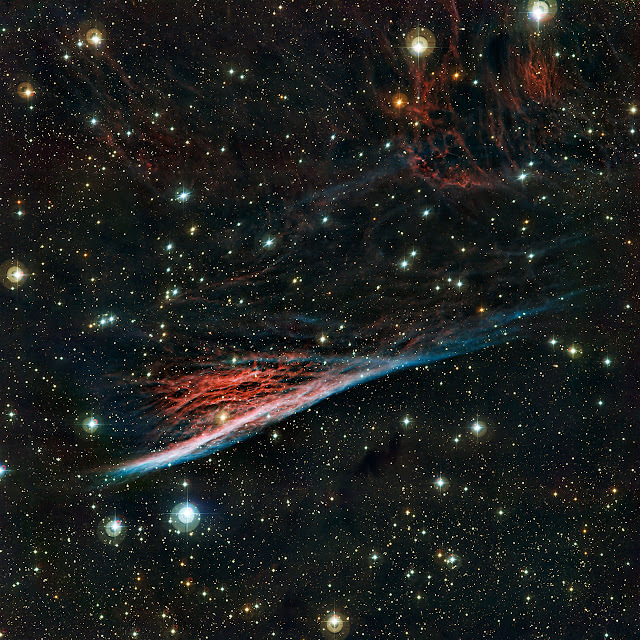 The Pencil Nebula is pictured in a new image from ESO’s La Silla Observatory in Chile. This peculiar cloud of glowing gas is part of a huge ring of wreckage left over after a supernova explosion that took place about 11 000 years ago. This detailed view was produced by the Wide Field Imager on the MPG/ESO 2.2-metre telescope. Despite the tranquil and apparently unchanging beauty of a starry night, the Universe is far from being a quiet place. Stars are being born and dying in an endless cycle, and sometimes the death of a star can create a vista of unequalled beauty as material is blasted out into space to form strange structures in the sky. This new image from the Wide Field Imager on the MPG/ESO 2.2-metre telescope at ESO’s La Silla Observatory in Chile shows the Pencil Nebula  against a rich starry background. This oddly shaped cloud, which is also known as NGC 2736, is a small part of a supernova remnant  in the southern constellation of Vela (The Sails). These glowing filaments were created by the violent death of a star that took place about 11 000 years ago. The brightest part resembles a pencil; hence the name, but the whole structure looks rather more like a traditional witch’s broom. The Vela supernova remnant is an expanding shell of gas that originated from the supernova explosion. Initially the shock wave was moving at millions of kilometres per hour, but as it expanded through space it ploughed through the gas between the stars, which has slowed it considerably and created strangely shaped folds of nebulosity. The Pencil Nebula is the brightest part of this huge shell. This new image shows large, wispy filamentary structures, smaller bright knots of gas and patches of diffuse gas. The nebula's luminous appearance comes from dense gas regions that have been struck by the supernova shock wave. As the shock wave travels through space, it rams into the interstellar material. At first, the gas was heated to millions of degrees, but it then subsequently cooled down and is still giving off the faint glow that was captured in the new image. By looking at the different colours of the nebula, astronomers have been able to map the temperature of the gas. Some regions are still so hot that the emission is dominated by ionised oxygen atoms, which glow blue in the picture. Other cooler regions are seen glowing red, due to emission from hydrogen. The Pencil Nebula measures about 0.75 light-years across and is moving through the interstellar medium at about 650 000 kilometres per hour. Remarkably, even at its distance of approximately 800 light-years from Earth, this means that it will noticeably change its position relative to the background stars within a human lifetime. Even after 11 000 years the supernova explosion is still changing the face of the night sky.